Another newcomer to Super Bowl ads has emerged. Kraft Foods will run a Mio Super Bowl 2013 commercial on February 3. 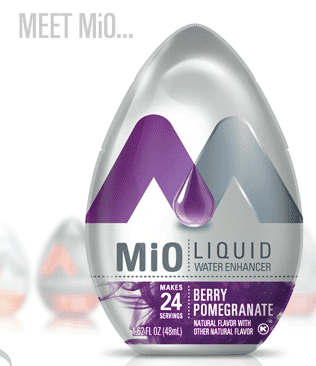 "Nearly two years since we launched, MiO has already proven to be a huge hit with millions of fans," said Doug Weekes, VP of Refreshment Beverages for Kraft. "So it's only fitting that our game-changing liquid water enhancer will lead the new Kraft onto the world's largest advertising stage during this year's Super Bowl." The Mio Super Bowl 2013 30-second ad will air during the third quarter of Super Bowl XLVII on February 3, 2013. MiO will release more details about the Super Bowl ad later this month. The Super Bowl 2013 will take place on Sunday, February 3, 2013 in New Orleans. Super Bowl Ads for Geeks will again offer full coverage about the Super Bowl Ads ahead and during the Super Bowl XLVII. The first big news is that Kate Upton will star in the Mercedes Super Bowl 2013 Ad. See all confirmed Super Bowl 2013 Advertisers. Until Game day, which will bring the new 2013 Super Bowl Ads you can check out the Super Bowl 2012 Ads. Possible Fiat Super Bowl 2013 Ads? David Letterman Super Bowl Cameo Coming Again?